Suspended ceilings come in different types depending on the structure and method of installation. The most appropriate and effective ones should be selected for each specific project. 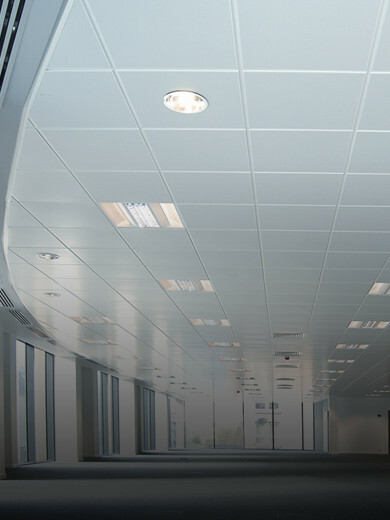 Vitality Contractors LTD specialists will take measurements promptly and discuss with you the type and material of suspended ceilings you need exactly. Our work is done to the highest standard possible with fully qualified specialists in the shortest terms. The one of the significant advantages of suspended ceiling assembling is that it hides communications and all base surface defects, creates smooth area. Most suspended ceilings have a dust-repellent coating and require minimal care. Also, suspended ceiling is easy to dismantle if necessary. Generally, simple suspended ceilings can be installed up to several days. Two-level suspended ceiling installation takes more time. It depends on the complication of the structure. The kind of suspended ceilings can be different: glossy, glass, matte, marble and mirror, and this is a significant plus of the suspended ceiling. Depending on the type suspended ceiling can be plasterboard, lattice, rack, cassette armstrong and stretch. Recently, the most common type of suspended ceilings is stretch ceilings, but not all designers give it preference. This type of ceiling can be installed very quickly, without dust and garbage, has an acceptable cost, lots of varieties, structures and installation methods so its popularity gains increasingly. According to texture and thickness of the canvas stretch ceilings have a wide variety and can look in the most incredible way, even like a textured plaster. However, specialists don’t have an unambiguous opinion. Some argue that the ecology and safety of the stretch ceilings are inferior to plasterboard and other types of suspension systems. They say that stretch ceiling is a some kind of package stretched on the construction so the balloon effect appears in the premises. The other experts guarantee the safety of stretch ceilings of certain manufacturers, providing correct further installation, reasonable exploitation, norms and standards compliance. Rack ceilings also look great in commercial and residential premises, conceal communications and possible surface errors, but they are not suitable for all premises, because installation takes up to 15 cm of ceiling height, and dismantling is a rather complicated and diligent procedure. Lattice suspended ceilings are widely used in the construction of large-scale premises, such as shopping centers, car dealers, because they occupy a decent area of the ceiling. But they can easily be combined with other types of suspended ceilings, create the effect of transparency and weightlessness, available in different colors. The disadvantage of this type of ceiling is a high price due to the aluminum included in composition, as well as a longer than other suspension systems installation. Cassette ceilings have a strictly square shape, a relatively high cost and require an additional height of the room, so more suitable for spacious halls, showrooms and centers. The plasterboard system of suspended ceilings is the most optimal of all the above types in the ratio of price and quality.